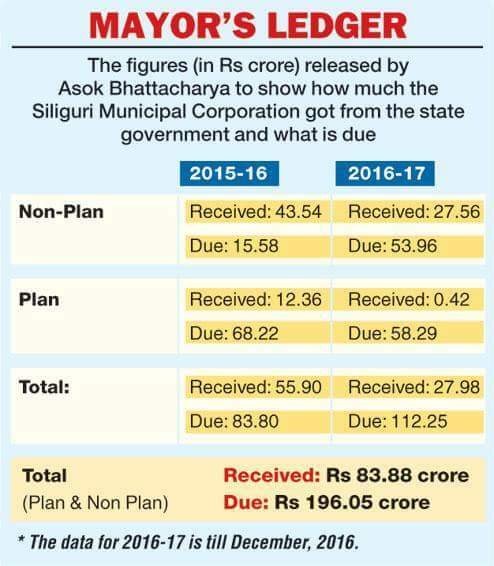 Siliguri mayor Asok Bhattacharya yesterday sprang a surprise by coming out with figures of how much the state government needs to give the civic body, a day before the Mamata Banerjee-led dispensation is expected to release its figures. Siliguri residents have, therefore, witnessed one half of what are back-to-back claims by a Left Front-run municipality and Trinamul-run government on how much the civic body has got from budget allocations and what remains. The Darjeeling district Trinamul had announced earlier that the party would publish a white paper on January 10 to apprise Siliguri residents of the funds that the state had provided to the Left civic body here. Bhattacharya, in a news conference yesterday, said: "During the 2015-2016 and 2016-2017 fiscals, we have received around Rs 83.88 crore from the state under plan and non-plan heads, whereas we are yet to get of Rs 196.05 crore from the government. This is based on the budgetary provisions made by the state government during these two financial years." He said: "This data is enough to prove that the state is biased against the Siliguri Municipal Corporation as we (the Left) are in power. During these two years, we had to struggle to run the civic body for this informal financial embargo by the state." The mayor, while giving out data under different schemes and projects and the funds due against each, demanded that the department concerned of the state publish a white paper to nullify his claim. "Attempts have been made by state ministers and Trinamul leaders to reject the information on funds, which I have time and again placed before the media. But till date, the state has not come up with any data to prove its stand. I, therefore, demand that the state municipal affairs and urban development department publish a white paper, mentioning in detail how much money has been provided to each civic body of the state under different heads. This, I believe, would make clear... the veracity of my claim," he said. Economists said lack of equality in distribution of funds was the principal issue that has led to the situation. "Like in many cases, the Centre does not allot necessary funds to states in case there is a government of a different party. The same is done by a state in case the same party is not in power at a local self-government level," Manash Dasgupta, an economist based in Siliguri, said.